Why would I need self storage in Monroe, NC? There are a variety of reasons why you might need self-storage in Monroe, NC. How much is a storage unit in Monroe, NC? The cheapest storage unit in Monroe, NC is $22.00 per month. What size storage units do you have available in Monroe, NC? In Monroe, NC we have sizes that range from 5'x5' to 20'x30' to suit your storage needs. How much is it for a 5'x5' storage unit in Monroe, NC? The cheapest 5'x5' storage unit in Monroe, NC is $22.00 per month. Monroe is a rapidly growing city in North Carolina's Union County, just a half-hour drive from nearby Greater Charlotte. It's in one of the most historic areas of the American South and features many notable historic sites and architecture. 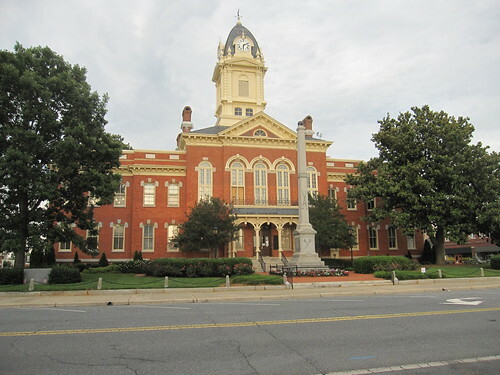 The city, named for U.S. President James Monroe, was established in the mid-19th century. Monroe enjoys beautiful weather most of the year, offering better air quality than most cities in the U.S. You'll find plenty of space, including many parks and recreational activities, throughout Monroe in which to enjoy the warm, mild climate. Belk Tonawanda Park offers expansive green spaces shaded by large oak trees and hosts many of the town's special events. Don Griffin Park offers picnic shelters, a playground and a baseball field, and Sunset Park is where many local Little League games are played. At Parks Williams Athletic Complex and the Monroe Aquatics and Fitness Center, you'll find many ways to stay active, whether you're interested in walking, jogging, shuffleboard, softball or horseshoes. Throughout Monroe, whether you live in the trendy downtown district or in the outlying suburbs, you're never far away from grocery stores, restaurants, shops and other amenities. There are a few gyms within the city limits as well as a library and a local theater. As a Monroe local, you'll also be able to enjoy the city's many community events. There's something going on in town nearly every weekend, whether it's a classic car show, movies in the park, an evening art walk or musical performances on Main Street. Holiday celebrations include the traditional holiday tree lighting, a Halloween festival and Independence Day fireworks. The Union County Public Schools district is responsible for the schools in Monroe. You'll be able to find a handful of private schools in the surrounding area, ranging from small preschools to large K-12 church-based campuses. Utilities: The city's utilities departments, which include the Energy Services Department and the Water Resources Department, provide major utilities in Monroe. Garbage and Recycling: Your trash collection services in Monroe include weekly trash collection (and a 96-gallon bin) and bi-weekly recycling and bulk-item collection. Transportation: Public transportation services in Monroe and the surrounding area include CATS Express Bus and the shuttle the county provides for seniors. Homes in Monroe are very affordable, with average prices lower than those in many comparable cities across the U.S. You can find both newly-constructed and established homes in a range of sizes and styles. Many of the homes in Monroe feature brick exteriors, wooden shutters and cozy front porches. You can also find plenty of spacious lots with large shade trees and lush landscaping. Our lowest priced units in Monroe, NC average $29.50 per month. 130 people have reserved units in Monroe, NC in the past 30 days. There are 2 locations within Monroe, NC's city limits.